View Cart “NDP Short Collection Bundle” has been added to your cart. 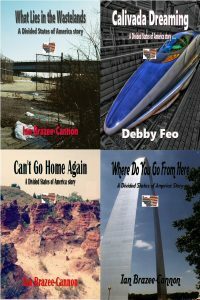 This bundle brings you the second set of four stories from The Divided States of America for just $3. You get “What Lies in the Wastelands” by Ian Brazee-Cannon, “Calivada Dreaming” by Debby Feo, “Can’t Go Home Again” by Ian Brazee-Cannon, and “Where Do You Go From Here” by Ian Brazee-Cannon.